May 17: According to PILDAT’s Report, the quality of democracy in Pakistan in 2015 has seen an improvement. However, except for holding of Local Government elections across all provinces of Pakistan, Cantonment Boards and the Islamabad Capital Territory, the quality of Pakistan’s democracy still appeared to be battling its way out after the turbulence of 2014. Even though in 2015 the quality of democracy is improving, it still has not recovered the shine and the optimism seen in 2013. Weakening writ of the civilian governments: The period under consideration saw the weakening of the writ of the civilian Government as its authority was eclipsed by a number of factors including the activism and visibility of the Military leadership in formulating policies and taking decisions. This was especially in relation to critical domains of our foreign policy and the internal security policy. This can also be considered fallout of the dharna, which saw humiliation of the elected Government at the hands of the protestors and the subsequent ascendancy of the Military influence. No major improvement in legislatures: Although sparks of improvements were witnessed, especially in the Pakistan Senate, no substantial improvement was witnessed in the performance of Legislatures during 2015. It still remains the case that the elected representatives do not consider the Parliament to be main arena of their duties; they spend most of their time and energy on attending to the personal issues like dealings with local administration, police, employment, postings, transfers etc. of their constituents rather than in the legislatures on their responsibilities relating to legislation, oversight and representation The Parliament also continues to be side-lined by informal and ad-hoc avenues of consultation, such as the All Parties Conferences. Both the Prime Minister, Mr. Nawaz Sharif and Mr. Imran Khan, leader of PTI – the third largest parliamentary party in the National Assembly – seldom attend an Assembly Session indicating the low priority they assign to the Parliament. For 2015, the Prime Minister attended 20% of the sittings of the National Assembly (17 out of a total of 87 sittings), whereas as Mr. Imran Khan only attended 2% of the total sittings (2 sittings out of a total of 87 sittings). The Leader of the Opposition in the National Assembly managed to attend 88% of the total sittings in 2015. Judiciary: With regards to the performance of the Judiciary, it emerged that speedy and economical access to justice remains a major problem, as evinced by the increasing and huge pendency of cases across most of the District Judiciary of Pakistan. A clear manifestation of the near-dysfunctional status of the courts was the formation of the Military Courts after the passage of the 21st Constitutional Amendment on January 06, 2016. It is widely apprehended that the elected Government may be seeking an extension in the law allowing Military Courts after the end of the two years sunset clause in 2016. No concrete action has been undertaken to reform Pakistan’s judicial system by now when more than half the time allowed to reform the judicial system has lapsed. These developments are accompanied by the fact that the people of Pakistan are increasingly seeking out informal and alternative methods of dispute resolution and justice. Consider the example of the so-called Sharia Courts set up by the Jamat-ud-Dawa. The parallel judicial system, which has been operative at least in the Federal Capital since 1990, has now been expanded so that 7 ‘Sharia courts’ are now functional, one each in Lahore, Gujranwala, Bahawalpur, Multan, Karachi, Quetta and Islamabad. However, Pakistan’s Superior Judiciary must be commended for pushing the Federal and Provincial Governments to hold Local Government elections. Had it not been for the persistence of the Supreme and High Courts, the Federal and Provincial Governments would have continued to drag their feet. The greatest improvement in the quality of democracy was witnessed in the parameter of the Institution of Local Governments, for which the score increased to 31.8% in 2015 from 19.3% in 2014 by almost 12.5 percentage points. Electoral Process & Management: With regards to Electoral Process and Management, although the recurrent theme remained the inability of the Election Commission of Pakistan to exert its Constitutional authority in 2015, the clean-chit granted by the General Election 2013 Inquiry Commission finally laid to rest the controversy surrounding General Election 2013. While the Commission did not find any evidence of organized and systemic rigging, it did find a long list of management issues with the ECP whose resolution should have been accorded a higher degree of priority by the ECP than is apparent. The ECP must, however, be commended for holding one of the largest electoral exercises in the history of the country, i.e. the Local Government elections. Weakening institutional decision-making: 2015 also brought to note an apparent aversion on the part of the Federal Government to revert to Constitutionally prescribed institutional avenues for decision-making such as the Federal Cabinet. The Federal Cabinet met only 4 times during 2015 whereas it should have met 52 times (‘Meeting of the Cabinet shall normally be held once a week on a day and time to be specified by the Prime Minister’) according to the Rule 20 (1) of the Rules of Business of the Federal Government. In other words, the Federal Cabinet was able to meet only for 8% of the times it was originally supposed to meet till the end of 2015, with the last meeting for the period under consideration held on September 16, 2015. Given that security remained one of the biggest challenges being faced in 2015, not even a single meeting of the National Security Committee ‘the principal decision-making body on national security’, was held during the year. Instead, the Prime Minister chose to carry out one-on-one interactions with the Chief of Army Staff. The Federal Minister of Defence was present in only 21% of these meetings. Weak Rule of Law: Rule of Law continued to be problematic in the case of Pakistan’s democracy in 2015. Incidents such as the case files of the SGS and Cotecna corruption cases of Mr. Asif Ali Zardari going missing, the constant and flagrant disregard shown by Gen. (Retd.) Pervez Musharraf for court proceedings, a dubious confession-video of Mr. Saulat Mirza emerging from his death-cell underlined the fact that the rule of law only seemed to be applicable in the case of the weak in Pakistan, while those with clout continued to flout it. Vibrant Media and new challenges: Both the electronic and print media continued to expand, not only in terms of the outlets, but also in reach during 2015. However, 2015 showed that the freedom of media is not only restricted to the control and coercion, or the lack of it, by the Government. Instead, a new form of media control is evinced by the almost one-sided criticism directed at politicians and elected leadership. While the Government control on the media is not so much of an issue now as a large number of privately-owned media channels have come on stream, the control of media by ‘establishment’ and various business interests has introduced a new dimension of the constraints on the freedom of expression. Accountability Institutions: The year of 2015 also saw regression with regards to the accountability structures in place in Pakistan. The National Accountability Bureau continues what can be best described as hedging, and at worst as abdication of its responsibility, exemplified by the list of 150 mega-corruption cases, which the organisation has yet to conclude. The list includes cases against high profile figures, including the Prime Minister, Chief Minister of the Punjab, former premiers, ministers and bureaucrats. Also consider that during 2015 PPP-led Sindh Government also criticized the NAB in the harshest terms along with introducing a Private Members Bill in the Senate to clip the NAB Powers. Sparks of Activism by the Civil-Society: With regards to the performance of the civil society, sparks of activism were shown by it in 2015 such as in relation to protesting the blocking of YouTube, the Lahore Bachao Tehreek, etc. However, no systemic improvement was recorded in this regard. It was however also seen that Pakistan’s civil society was seen to be operating in an atmosphere of uncertainty. Following the temporary closure of Save the Children (an INGO) in Islamabad, the Federal Government has introduced a new policy for NGO & INGO registration. Constitutional Framework – Need for reforms regarding the status of AJK, GB and FATA: It remains unfortunate that one of the key concerns regarding Pakistan’s constitutional framework, that is on granting a Provincial Status to Azad Jammu and Kashmir, Gilgit Baltistan and the Federally Administrated Tribal Areas (FATA) persists even in 2015. Additionally, people of Gilgit Baltistan and Azad Jammu and Kashmir are even deprived of representation in the National Assembly and the Senate. Many jurists believe that these territories can be given provisional representation and provincial status without compromising the legal stand of Pakistan on the issue of Jammu and Kashmir. According to PILDAT’s assessment, four parameters received a score of either 50% or more in 2015. These included the Performance of the Media (50%), Constitutional Framework (50.7%), Electoral Process and Management (51%) and Civil Society (51.4%). 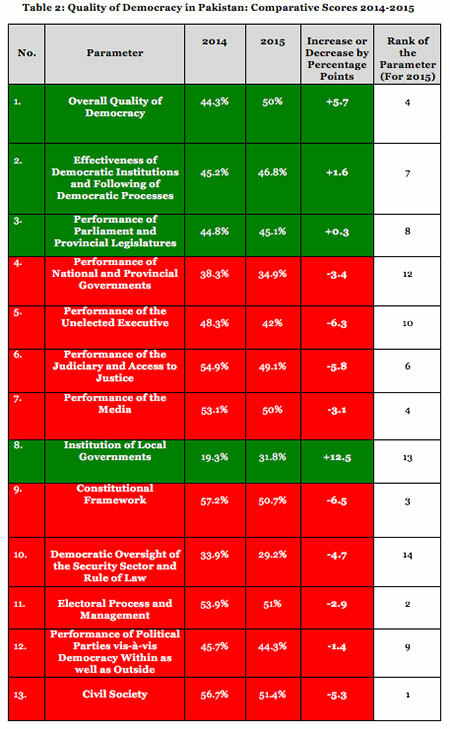 For 2014, these parameters included Performance of the Judiciary and Access to Justice (54.9%), Performance of the Media (53.1%), Constitutional Framework (57.2%), Electoral Process and Management (53.9%) and Civil Society (56.7%). For 2013, these included Constitutional Framework (55.2%) and Electoral Process and Management (53.8%). Therefore, Performance of the Media, Constitutional Framework and Electoral Process and Management are three parameters that have consistently received high scores for the past three years in the context of quality of democracy. 4 parameters scored less than 40% for the democracy assessment in 2015, signifying that these areas remain a cause of concern. These include Performance of the National and Provincial Governments (34.9%), Institution of Local Governments (31.8%), Democratic Oversight of the Security Sector and Rule of Law (29.2%) and Human Rights (38.2%). In 2014, the parameters scoring less than 40% included Performance of National and Provincial Governments (38.3%), Institution of Local Governments (19.3%), Democratic Oversight of the Security Sector and Rule of Law (33.9%). In 2013, these low scoring parameters included Performance of the Unelected Executive/Bureaucracy (36.9%), Institution of Local Governments (16.5%), Democratic Oversight of the Security Sector and Rule of Law (31.3%) and Human Rights (25.8%). Therefore, Performance of the National and Provincial Governments, Institution of Local Governments, Democratic Oversight of the Security Sector and Rule of Law, and Human Rights remain repeated areas of concern for the past three years in the context of Pakistan’s democracy. A comparison of the highest and lowest scoring democracy-assessment parameters at the end of 2013, 2014 and 2015 is given in Table 1.